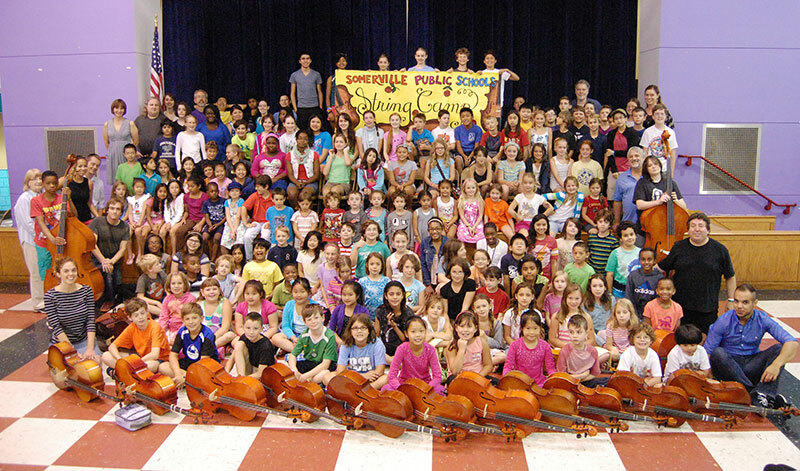 The Somerville String Fest is open to violin, viola, cello and bass students age 7+ from Somerville and surrounding communities. Beginners are welcome! Students with a year or more of experience will be placed in orchestra according to their ability. The string camp offers daily orchestra rehearsals, chorus, chamber music, and music theory. Classes include technique and improvisation. The camp is a great opportunity for string students to refine their playing abilities over the summer. Ages: students 7 and up. Tuition for the two-week camp is $160 for Somerville residents, $190 for non-Somerville residents. There is a $10 discount for payments received by May 1. Student concert Friday, August 2nd at 11:00am. Parents, guardians and the public invited. Arrive early on the first day to pick up your schedule! The front desk opens at 8:00am. Learn the basics and enjoy the delights of playing in a brass street band, like the bands that come to Somerville's annual HONK! Festival. It's all about having fun while playing lively dance music from American and other street band traditions. Open to anyone who plays woodwinds, brass or percussion, preferably with at least one year's experience on a chosen instrument. Ages: Fifth grade and up. Families and parents are encouraged to apply! Please contact Kevin Leppmann with any questions. Ages: Students entering grades 1-4 in the fall. Cost is $160 for Somerville residents, $190 for non-Somerville residents. Students will perform in a short concert for the public at 11:15am on Friday, July 13th. Parents and guardians are encouraged to attend!